Celebrate the New Year in style on this special Eastern & Oriental Express itinerary. This exclusive New Year's Eve train journey travels from Singapore to Thailand, via Malaysia, culminating in a celebration dinner on board and party on the beach. Arrive independently at Raffles Hotel for a private check-in at the hotel. The gleaming green carriages of the Eastern & Oriental Express await you at Singapore's Woodland Railway Station. As you arrive you are welcomed by stewards in exquisite Thai uniforms with their hands pressed together in a gracious "wai" - a promise of the journey to come. A cool drink is served as you settle into your luxurious cabin. The whistle blows and the train sets off through the city, over the Straits of Johor into Malaysia and out into the countryside beyond. Afternoon tea is served on board, then spend time relaxing or exploring the train. Make your way to the Bar Car for an aperitif and the chance to meet other guests. Enjoy a decadent dinner in one of the opulent dining cars and later, listen to the resident pianist playing nostalgic melodies in the Bar Car. Breakfast is served in your cabin before arriving in Butterworth. Later disembark, ready for the day's adventures. Explore Penang's Tropical Spice Garden, home to over 500 species of tropical flora and fauna set in 8 acres of secondary jungle. Spend time on a tour of Georgetown, which is the capital of the island and state of Penang. The tour includes the town's pre-World War II mosques, temples, churches, bazaars and shophouse. A magnificent Tiffin lunch at a local restaurant before you rejoin the train. Back on board watch the ever-changing scenery from your cabin as you enjoy afternoon tea and cross into Thailand. Later, change for dinner and savour an aperitif in the Bar Car before making your way to the restaurant car for a sumptuous dinner. Awake to breakfast in your cabin before spending the day relaxing in your private cabin, or swapping tales with fellow passengers in the Observation Lounge. Lunch is served on board the train and your afternoon is at leisure. In the evening it's time to dress for an elegant New Year's Eve Dinner on board. After dinner, guests can change into sarongs and beach wear and head to the beach for a New Year's celebration party, with champagne, fireworks and live music. Start the first day of the New Year with a relaxing morning on board as the train travels to Bangkok where you depart for your own onward arrangements. 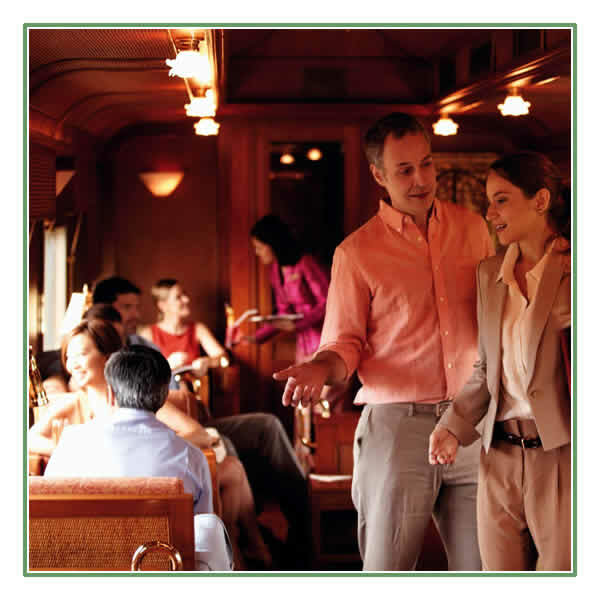 › One way journey in a double compartment on the Eastern & Oriental Express, including meals. › Excursions as described in the itinerary. Please note : Eastern & Oriental Express timings and route are subject to change without prior warning due to last minute railway engineering works or similar. Hotels are on request and subject to availability and cannot be processed until a deposit is received.